This post is sponsored by Burke Décor. As always, all words and opinions are my own. See my full disclosure policy HERE. 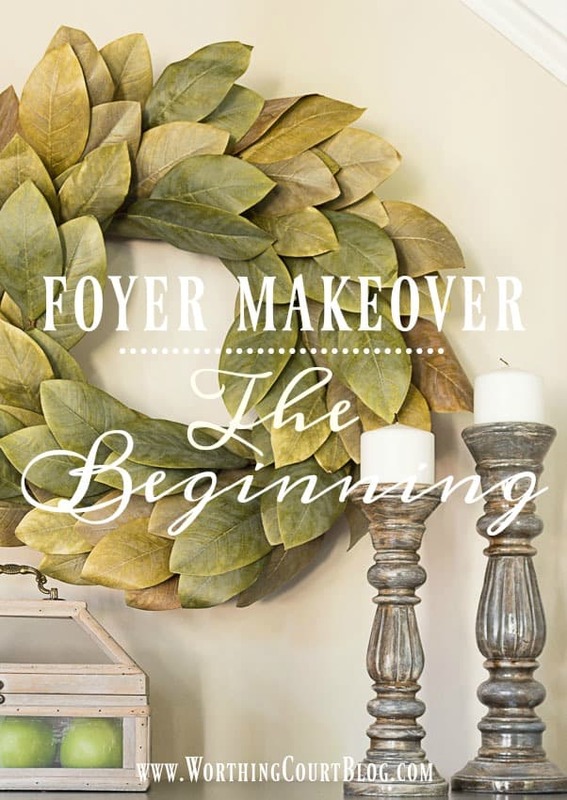 All that’s about to change though – my foyer is on its way to becoming the happy first impression that it should be! It all started with this magnificent Dash & Albert indoor/outdoor rug from Burke Décor. I’ve never seen an indoor/outdoor rug quite like this one. 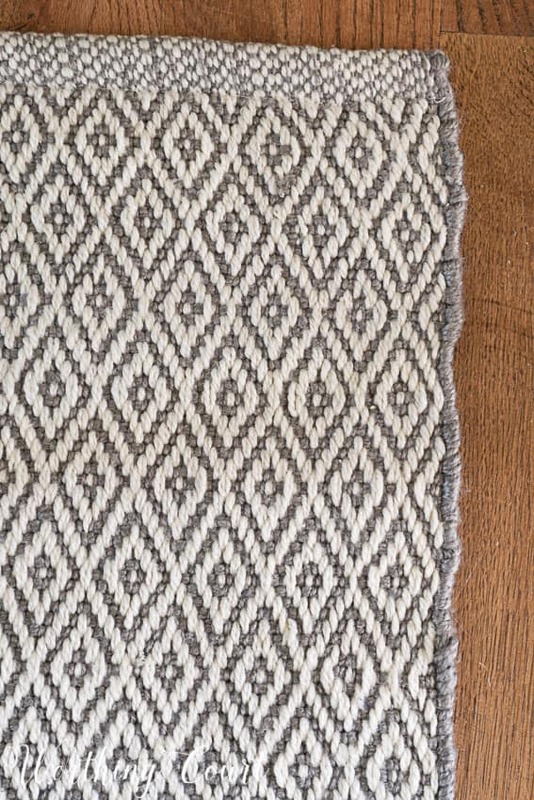 It has a handwoven look and is soft and cushy underfoot. And bonus! The small’ish pattern will help to hide any dirt and grime. If it ever does need cleaning, all I need to do is to take it outside and hose it off. You can’t beat that for ease of care! We offer high-quality, and one-of-a-kind products as well as some of the most respected and innovative brands in the industry. 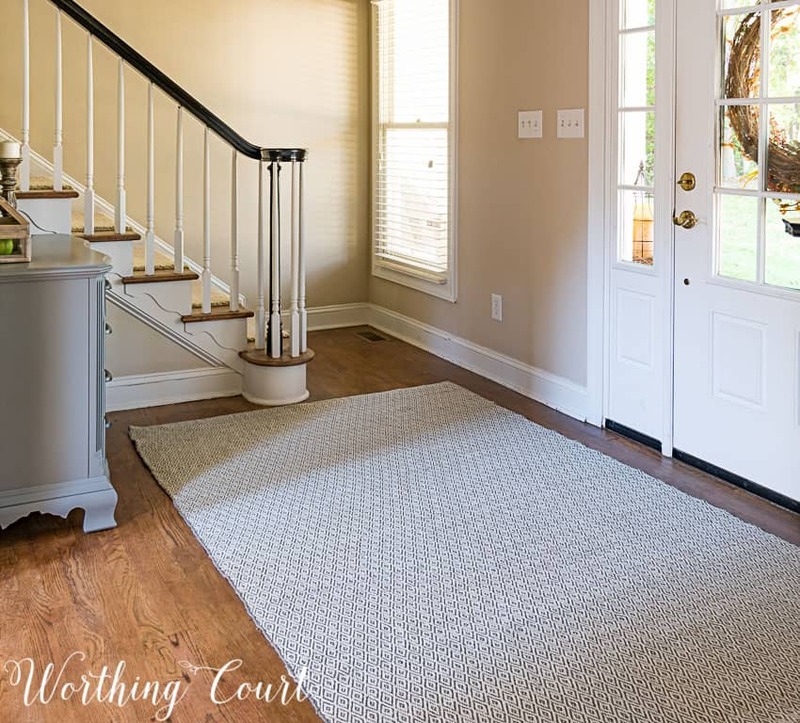 OK – back to the foyer – the rug spurred the first of several projects that I have planned for this area. First up was the transformation of my cherry chest. It’s no longer sporting its traditional, early American vibe. Gray paint and new hardware have given it a whole new look. I used Sherwin Williams semi gloss paint in the color Software on it. I’m not sure how the chest will be styled once the foyer is finished, but for now, I have it styled very simply with a magnolia wreath and some candlesticks. Even though I’ve made only two changes, the foyer is already showing its happier and brighter side! Now I no longer need to cringe and make apologies when someone comes to my door. I’m undecided about how to treat the wall going up the steps. A part of me wants to do a gallery wall, but I’m afraid that we’d constantly be bumping things and knocking them off. I probably will wind up trailing three or four large prints up the wall. Another dilemma is how to treat the window? It’s location is a bit awkward. I can’t really hang a pair of draperies there. Maybe one panel, on the side of the window in the corner, paired with a shade of some sort. We’ll see. This wonderful rug is already bringing my foyer to life. Plus, it’s Buddy approved! Suzy, I have that same piece of furniture and had been considering letting it go. Not now! You completely changed it. Love the rug too. 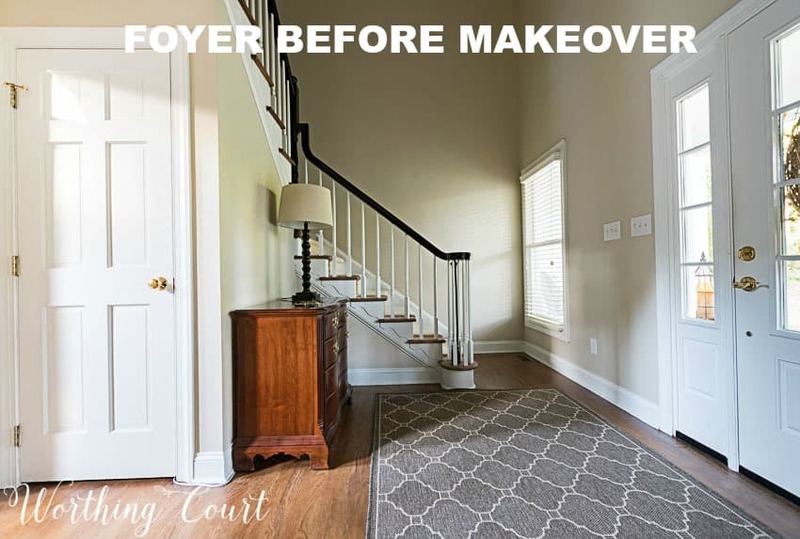 I love what you’ve done to your foyer. 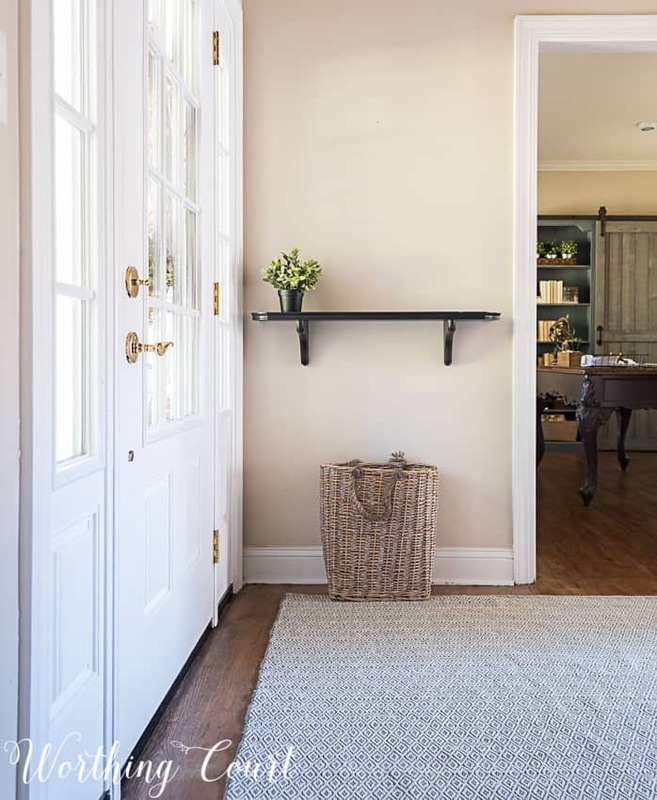 Now I wish I had a foyer to decorate. My husband just looked at me like “oh no, another project”. Did you make or buy your wreath? Hi Lynn. 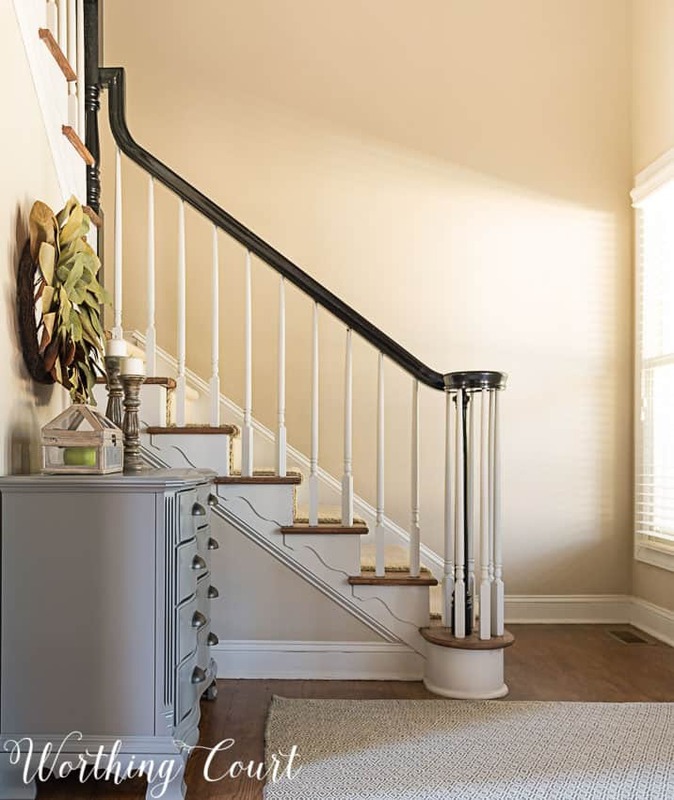 Our bannister is painted with black oil based paint in a gloss finish. It was originally stained oak, so the painters primed it before painting. You are such an inspiration! Our foyer hasn’t been spruced up since we moved. I won’t tell you how long ago it’s been 🙁 We definitely need to paint and make things more attractive. I’m looking for a small chest like yours – we really need storage since we downsized. I’m looking forward to seeing the rest of your changes. It is beautiful! 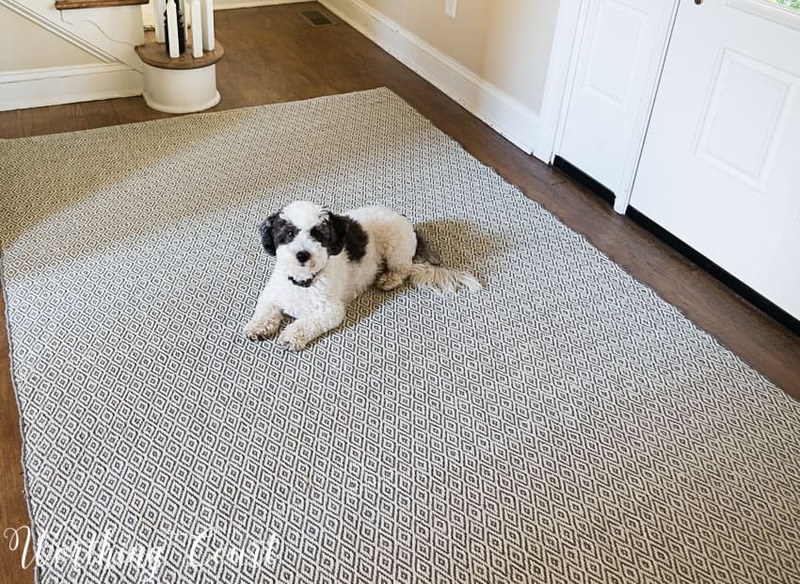 I’ve had my eye on Dash & Albert rugs for sometime and now I’m really wanting one. I too would love to know about your “black” bannister. Painted or stained? Hi Vicki. Our bannister is painted with oil based black paint in a gloss finish. It was primed before painting. Great update to the early American piece! It looks great! You are inspiring me to lighten up my foyer. Where did you get your magnolia wreath? I like the rug also. I am in the market for a new one in my entry. I also repurposed a piece of furniture to put in the area. You are on your way. The magnolia wreath is beautiful. I, too, have a coat closet that is already brimming! I added coat hooks on the inside of the door and now have a place to hang a couple of extra coats. hope this idea helps. It looks great! I love painted furniture!!! No better way to bring new life to an older piece. I just love the chest and have one from my parents that is hard rock maple . I have not been able to decide what to do with it until I saw yours. I hope that you will share the paint info as I would love to redo my chest before Christmas, as my husband’s family are visiting this year. Thanks for your blog and inspiration. Really pretty… it is hard to lighten up spaces where there is so much dark wood. 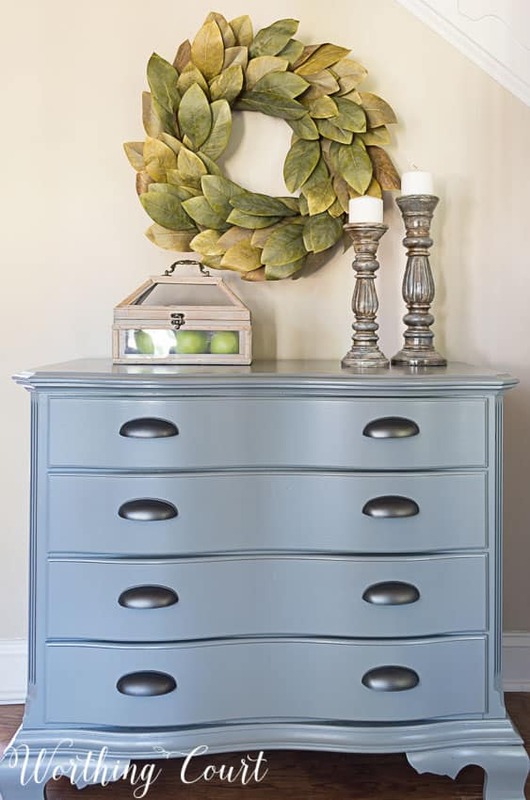 I Love the color of the dresser! It’s stunning! Hi Pam. I can’t remember for sure, but I think that I found the glass display box at TJ Maxx. Sorry I can’t tell you for sure! I love this rug. I’ve been looking for three of them for the last few months and can’t seem to find one that I like I’m going to give this site a try. 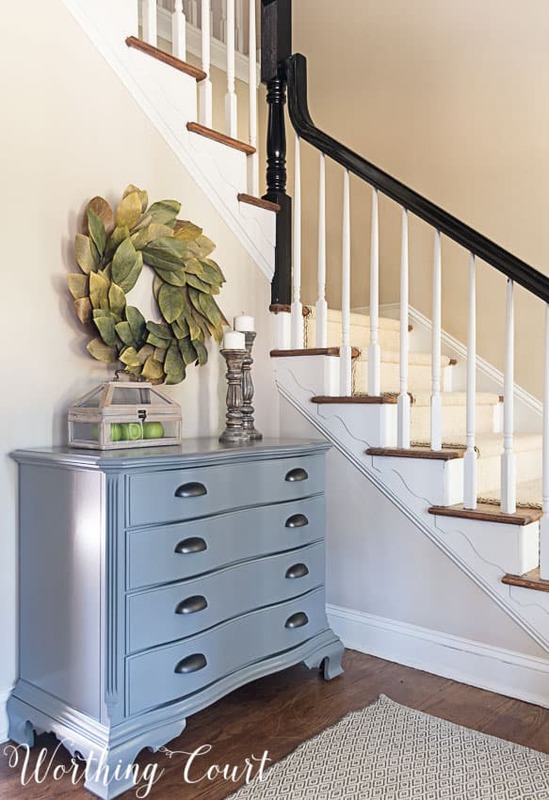 Your foyer looks lovely – it’s so fresh! I love the magnolia wreath, also. Hi Brenda. The chest is painted with Sherwin Williams Software, in a semi gloss finish.